Horseshoe crabs are among the world's oldest and most fascinating creatures. They are estimated to be at least 300 million years old. The earliest horseshoe crab species were crawling around the Earth's shallow coastal seas for at least 100 million years before the dinosaurs even arrived, which was about 200 million years ago. Since that time, the Earth's land masses have shifted dramatically, thousands of other species have come and gone, but horseshoe crabs have survived and today remain much as they were those millions of years ago. Horseshoe crabs have been used by people for centuries. More recently, they have been instrumental to scientific research that has contributed significantly to human health. It takes eight to ten years for horseshoe crabs to reach adulthood. Scientists are not sure how long horseshoe crabs live, but some speculate that they can live for 20 years or more. Because very few horseshoe crabs live to maturity, the ones that do must have a life span that enables them to reproduce for a number of years. The horseshoe crab has remained virtually the same for millions and millions of years. In virtue of that fact, the horseshoe crab, which is estimated to have inhabited the Earth now for over 300 million years, is often called a “living fossil”. Most scientists believe that horseshoe crabs are the closest living relative of the trilobite, a marine animal that has long been extinct. Scientists believe that horseshoe crabs were among the dominant creatures some 300 million years ago. There may have been many different species of horseshoe crabs. Today, four species of horseshoe crabs inhabit the earth's oceans. Limulus polyphemus is found along the western Atlantic and Gulf coasts from southern Maine to the Yucatan Peninsula, with the Delaware Bay as the center of the population. Tachypleus gigas and Carcinoscorpius rotundicauda are found in the Indo Pacific region from the Bay of Bengal to Indonesia and Borneo. Tachypleus tridentatus ranges from the Philippines to the southwestern seas of Japan. Blue Crab... In spite of their colorful name, blue crabs are mainly grayish to bluish green. Only the claws are blue, and the claws of mature females also have bright orange red tips. There’s another easy way to distinguish males from females: Maryland locals look for the "apron." Males have a “t” shaped abdomen, and females have triangular abdomens that become rounder as they age. Crabs grow by shedding their shells, a process called molting. They take in water to expand and break out of the old shell. A new soft shell underneath hardens quickly. With three pairs of walking legs, they generally walk sideways, clearing a path with sharp lateral spines. Large, powerful claws are used for defense, digging, sexual displays, and to gather food. Males typically grow larger than females, sometimes reaching seven or eight inches from point to point, although five inches is the legal size for harvesting. Reportedly, some males have grown to about ten inches. Crabs are bottom dwelling predators that live along the Atlantic Coast from Cape Cod to Florida. Loss of habitat, combined with the blue crab’s popularity as a food for humans, has led to serious drops in populations. Population of Chesapeake Bay crabs has grown since 2001, but the future remains uncertain. They are not only predators, they are also prey: some bony fish, as well as some sharks and rays, feed on juveniles and larger crabs, and the blue crab is the preferred food of the Atlantic Ridley sea turtle. Award... thank you, Elisabeth at http://foodandthriftfinds.blogspot.com for the award. I truly appreciate it very much. Mix all ingredients together. Store in airtight container. Chill until ready to serve. Enjoy! Mmmm... I haven't had a good crab salad in at least 7 years... Now I'm craving it... lol! Hi Christine! I used to live at the mouth of the Chesapeake Bay - They love their blue crabs there! Unfortunately, I am deathly allergic to crabs (new allergy - about 8 years old) and carry EpiPens for protection. ...but I love crab dip! Your history was - once again - interesting and informative! Hi Petra, welcome! We are happy to have you here. Hi Ann, sorry to hear you are allergic to crabs. I would love such snack. Crab meat has such a lovely taste. This looks lovely - crab is one of the best types of seafood - delicious! So glad I came by today. Everything here looks so good. I could spend a whole morning checking out all your recipes. The crab salad looks wonderful. I will have to try it. Have a great weekend. Thanks for coming by my place. Congrats on your award, dear! Christine, this crab salad sounds very delicious, and the way you wrote about crabs...now, I know so much about these creatures! That was really informative. Thanks for that and for this delicious recipe! That sounds like a wonderful dip. I love reading all of your history and background that you include with each post. I learn so much! This was so interesting! I had no idea crabs have fun been around for so long. I have the hardest time finding good crab meat - this was an inspiration to try harder to find it :) thanks! This is a great dip, I will be on the lookout for the pollock and crab mix. I have not seen it, but have not looked either. Thanks for such an informative and delicious post. I can see sitting down with this and a spoon and just eating the whole thing :-P. Thanks for sharing, Christine! When I was little my Dad used to buy crab salad and I loved it, but I am sure it doesn't even compare to yours! This sounds amazing :)! I like this simple recipe very much Christine, great finger food. Only thing am wonderful whether I can the ingredients at my place. Let me check out and see so that I enjoy this. Sounds very tasty. I'll be trying it soon. I have a shrimp dip I used to make all the time. 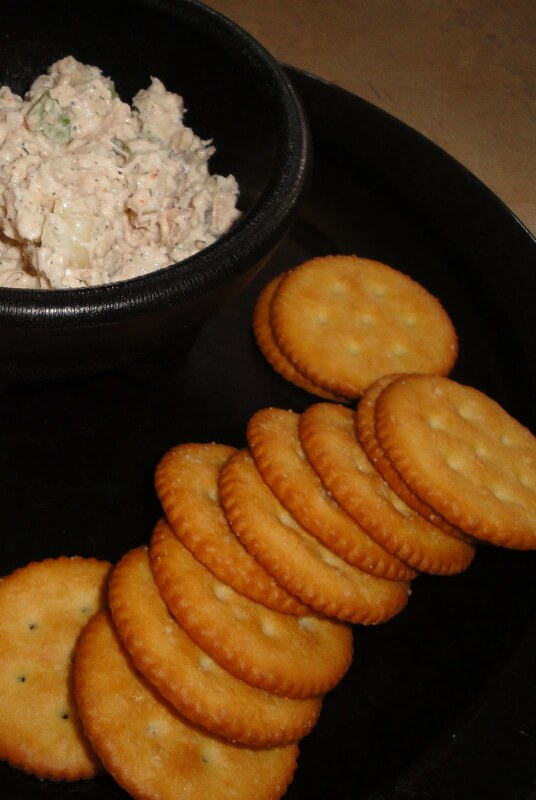 Recently I've been making a very simple dip made with smoked chicken or smoked salmon. Wow what a wealth of information! Thank you for sharaing, I have a new learning today. Congratulations on the award too! Hello Christine, thks for dropping by Luxury Indulgence & leaving your lovely comments! Very nice blog here! I love crabs & the salad is lovely :) Looking fwd to more sharing! My stomach is rumbling and my mouth is salivating!